One of the first things that anyone with incontinence needs to do when they are first diagnosed is find the right incontinence product for them. This can be a challenge simply because of the volume of incontinence supplies that are available today for those people with incontinence. Today, sites that offer adult incontinence supplies have many different choices when it comes to incontinence pads, incontinence underwear and even adult diapers. The good news is that this means that incontinence sufferers can find the right incontinence product to meet their needs. Best of all they can make this choice online right from the comfort and privacy of their own home. 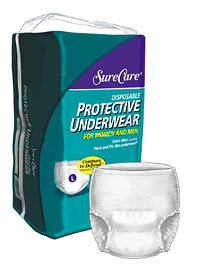 Surecare incontinence products offer more then just incontinence underwear. While most people are initially concerned with finding the right incontinence undergarment there are other incontinence products that you should consider, as well. Surecare incontinence products also offer incontinence bed pads (that are also known as incontinence under pads), to help protect bedding and furniture. This type of incontinence product can be helpful for anyone from children who are having difficulty staying dry at night on up to the elderly who are bedridden and need extra protection. Surecare incontinence products have a variety of different absorbencies. The reality is that not all incontinence is the same. Not everyone will need the same level of absorbency and protection. In addition, many people find that they need a certain level of protection during the day and a different or heavier protection at night. Surecare incontinence products offer a wide variety of levels of absorbency so that you can choose the right incontinence undergarment to fit your needs. Surecare incontinence products have a range of different sizes. It is important to realize that fit is a crucial component as to whether or not incontinence underwear will work and offer the most in protection and absorbency. If the incontinence sufferer is wearing an incontinence undergarment that is too small or too big they are at risk for leakage and accidents. Surecare incontinence products offer a wide variety of sizes so that you can find the right size for you no matter what incontinence product you choose to use. This means that Surecare protective underwear can work for a large range of people who are all different sizes. This makes them a great choice no matter the age of the incontinence sufferer. Surecare incontinence products are affordable. There is no denying the fact that incontinence products can be expensive. Surecare offers their protective underwear line for an affordable price. Since those people with incontinence are often making a long term purchase it helps to know that you are getting a high value incontinence product for the money that you spend. Surecare provides a high quality incontinence product for an affordable price. Labels: adult diapers, adult incontinence products, incontinence products, incontinence supplies, incontinence underwear, sure care, surecare, surecare incontinence products.